As the most important appliance in a laboratory, fume hoods serve a critical role. They keep employees safe by removing harmful vapors and chemicals out of the work area. The air they extract is then filtered by the building’s exhaust system before exiting the facility. That, right there, is the simple, two-sentence version of how a ducted fume hood works. But let’s dig a little deeper into how these devices function. As stated, the primary purpose of the fume hood to contain gases, vapors, and fumes and then exhaust them out of the area. The fume hood begins this process by pulling room air into and through the fume. The air enters the hood through the sash. Depending on its design, the sash may move vertically or horizontally, or a combination of the two. The sash also acts as a barrier between the worker and the inside of the fume hood and provides limited protection. 1. Volumetric Flow of Air: This is a measure in cubic feet per minute or CFM. What this means is that air is filling a cubic foot of space, and then the velocity at which air flows out of that space is being measured. This is important because having too much or too little air, will affect the performance of the hood. Finding the proper balance is what leads to optimal fume hood performance and efficiencies. Because fume hoods move mass quantities of air, makeup air needs to be added to the room to maintain this proper balance. If the room is small or if there are a large number of fume hoods in the same room, an additional supply of air, other than the normal room ventilation, may be required. 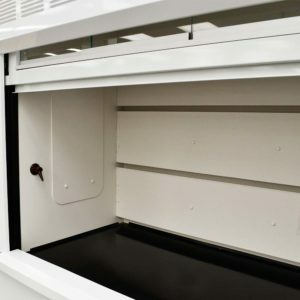 If the makeup air supply is not adequate or the makeup air is switched off then the fume hoods may not be able to achieve the required face velocity causing fumes to escape into the laboratory. 2. Face Velocity: This is the speed of the air entering the front of the fume hood and the height of the sash plays a critical role in this measurement. A good analogy for face velocity is a garden hose which can’t quite reach the outer perimeter of the yard. Water will flow through a garden hose at a normal rate. But when you put your thumb on the end of the hose and create a partial blockade, the water exits with much more force. The same amount of water is still entering the hose and the same amount of water is exiting the hose. But because of the blockade of your thumb, the exit velocity increases. The same can be said for how air moves through a fume hood. The fume hood sash is acting as the blockade and can control the linear rate of air moving through the opening of the fume hood. As the air flow works its way through the middle of the fume hood, it pushes the harmful gases, vapors, and fumes toward the exhaust area. This area is managed by slots and baffles which act as exit doors for the fume hood before reaching connected ductwork. In many fume hoods, the slots and baffles are adjusted to allow for even air flow. If the baffles are closed (or blocked) the exhaust path will also be blocked. But when used properly, baffles eliminate dead spots or reverse air flows which would result in a loss of containment. After air exits the fume hood it is transported through ductwork to where it is released into the atmosphere; or on ductless fume hoods, the air is filtered and recirculated back into the room. There are certain fume hoods for special uses and some even cater to specific reactions and chemicals. It is always best to consult the manufacturer’s recommendations for proper use and safety standards to ensure that your hood is efficient and effective. National Laboratory Sales is the exclusive distributor of Fisher American fume hoods and also has a large selection of hoods from Labconco, Fisher Hamilton, Kewaunee, Hamilton Scientific, and many others. Search our impressive inventory to find a fume hood that works for you. How Often Should A Fume Hood Be Inspected?